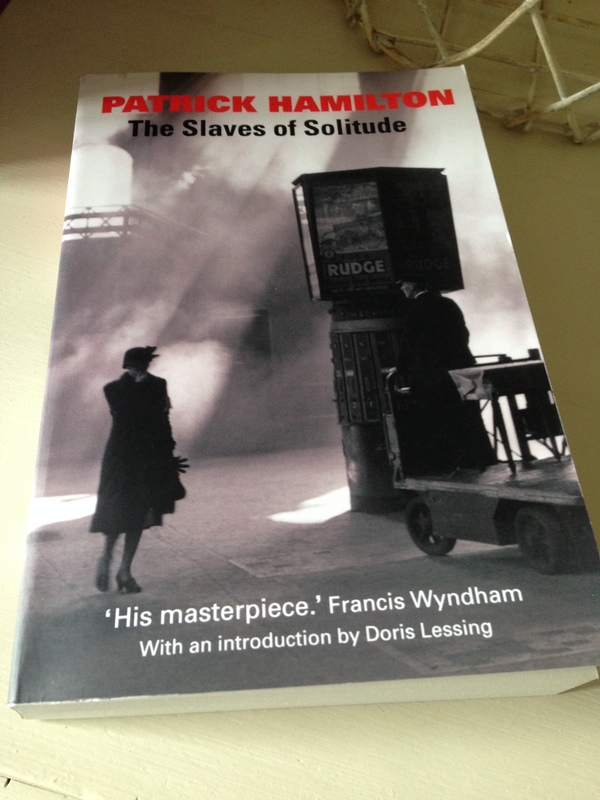 Set largely in the seedy bars and boarding houses of London’s Earl’s Court, Patrick Hamilton’s 1941 novel Hangover Square centres on the tortured existence of George Harvey Bone, a thirty-four-year-old man who is obsessed with a beautiful yet vindictive young woman named Netta Longdon. It is an utterly brilliant portrait of a man on the edge, perfectly capturing the sudden changes in mood and mindset of a lonely and tormented soul, driven to distraction by the heartless woman he so deeply desires. Somehow or other, Bone – a large, heavyset man, a little slow on the uptake but fundamentally a decent person at heart – has got himself mixed up with a thoroughly rotten crowd. More specifically, he has fallen under the spell of the magnetic Netta, a half-hearted wannabe actress whose only redeeming quality appears to be her striking beauty. Bone idolises Netta, creating an illusion in his mind of the type of relationship he wishes to have with her – a quiet, idyllic life in the countryside, complete with a little farm or cottage to match. In reality, Bone knows this is unattainable; nevertheless, he longs to spend time alone with Netta, hoping to prise her away from her vile friends, the fascist bully, Peter, and other associated hangers-on. Netta, for her part, largely rejects Bone’s advances, treating him with scorn and contempt; but she is also sharp enough to draw on his resources whenever it suits her. At heart, Netta is a cruel, manipulative woman, a schemer who knows exactly how to play Bone to perfection, taking advantage of his unbridled generosity and intense feelings towards her without a second thought for his well-being. In the following scene, Netta has agreed that Bone can take her out for the evening as long as their destination is Perrier’s, a well-to-do restaurant in the heart of the West End. At first, Bone is delighted at the prospect of a quiet, intimate dinner with Netta, if only for a few hours; but then it dawns on him that she may well have an ulterior motive for wanting to go there and that he is simply being used as a convenient vehicle to facilitate this trip. By the end of the dinner, Bone’s fears are confirmed, a realisation that leaves him feeling more lonely and miserable than ever. Running through the novel are Bone’s ‘dead moods’, periodic episodes when something goes ‘click’ inside his head and he slips into a different mode, one where another, more sinister side to his personality comes to the fore. It is as if the familiar ‘regular’ world has suddenly fallen away, only to be replaced by a muffled and mysterious one. Quite soon after falling into one of his dead moods, Bone remembers that he has a job to do: he must kill Netta Longdon and go to Maidenhead where he will be happy, and everything will be all right. This business with Netta has been going on long enough, so he must put a stop to it once and for all – and he must plan everything carefully to avoid getting caught. (This isn’t a spoiler, by the way, as the novel opens with one of these episodes during which Bone’s homicidal tendencies are made abundantly clear right from the start. Moreover, Bone associates Maidenhead with a brighter, more peaceful time in his life – a splendid fortnight he spent there with his sister, Ellen, some years earlier when she was still alive – hence his fixation with returning to the town to recapture these elusive feelings.) Fuelled by his heavy drinking and the emotional strain of dealing with Netta, Bone begins to experience these dead periods on a more frequent, more intense basis. In spite of this, Bone has absolutely no recollection of what he has been doing or thinking during these episodes – they can last from a few hours to a day or more – once he returns to ‘normal’ mode. This makes the storyline all the more gripping as we follow Bone and his shifting mindset from one day to the next. Hamilton uses repetition to great effect in this novel, both in the depiction of Bone’s dead periods and in the portrayal of his feelings towards Netta. For the most part, Bone is besotted with Netta, even though he knows she remains largely out of his reach. Nevertheless, there are times when he comes close to waking up to the fact that she is simply playing him for a fool. In this scene, Netta has agreed to come away with Bone to Brighton for the night, if he will pay her way and give her fifteen pounds to clear her outstanding rent and other bills. What in God’s name did it all mean? Was this a change? Had her feelings somehow changed, had his persistence somehow prevailed, so that in future she was going to be kinder to him, so that in future he might, even, have a chance with her? Hangover Square is an utterly compelling character study of a lonely, desolate man driven to distraction by a terrible femme fatale. Hamilton perfectly captures the inner solitude and isolation of Bone’s existence as he slopes from one bar to the next, waiting for an opportunity to call or visit Netta for a few moments each day. There is great attention to detail here, particularly in the depiction of the pubs in Earl’s Court: the thick smoke; the infernal noise; the damp, claustrophobic atmosphere inside, especially during winter. In other words, the book excels in its depiction of the nightmarish world of the habitual drinker and the hopelessness of his solitary existence. The time period in which the story is set feels very significant too. The year is 1939, with Britain poised on the cusp of WWII. Fascism is on the rise, a development which is echoed through Hamilton’s portrayal of Netta’s friend, Peter, and his equally nasty acquaintances. Without wishing to give away too much about the ending, there is a growing sense unease in more ways than one as the story moves towards its somewhat inevitable conclusion. All in all, this is a really tremendous book, one that is sure to make my reading highlights at the end of the year. In many ways, it feels like the ideal companion piece to Hamilton’s later novel, The Slaves of Solitude, which I also adored – you can read my review of it here. 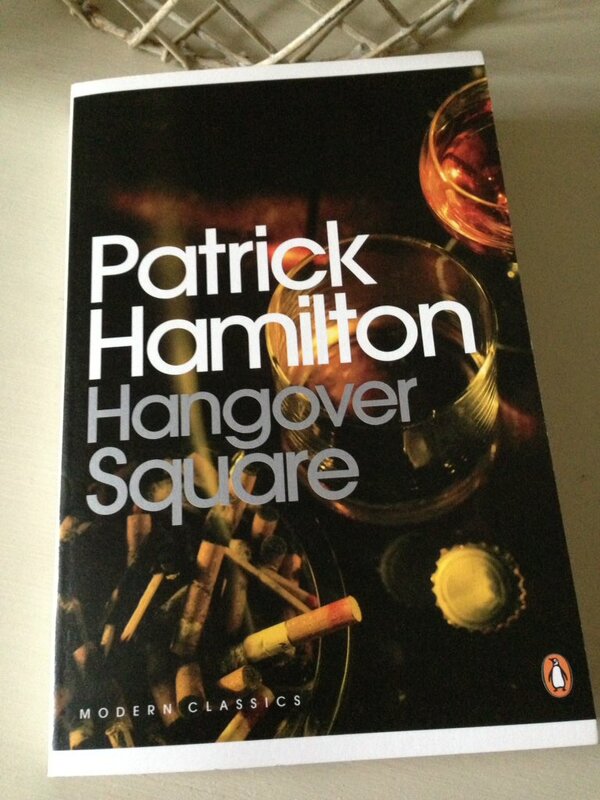 Hangover Square is published by Penguin Modern Classics; personal copy. This entry was posted in Book Reviews, Hamilton Patrick and tagged Boarding Houses, Book Review, Classics Club, Fiction, Patrick Hamilton, Penguin Modern Classics, UK, WW2 on March 14, 2017 by JacquiWine. Best known for his poetry, Philip Larkin wrote two loosely connected novels during his lifetime. The second of these, A Girl in Winter, concerns itself with the confusing mix of emotions which characterise a critical period in a young girl’s life: her coming of age. It also captures the deep sense of loneliness and isolation that marks its central character, a woman named Katherine Lind. First published in 1947, A Girl in Winter represents my contribution to Karen and Simon’s 1947 Club which is running next week (my post is a little early as I’ll be offline during the event itself). It’s a quiet, contemplative novel, one that explores the difficulties we face in understanding and interpreting the behaviour of others, especially when we are young and inexperienced and eager to be loved. I hope to find a place for it in my end-of-year highlights. The novel focuses on Katherine Lind, a twenty-two-year-old girl who is working as a temporary assistant in the town’s library. As the story unfolds, we start to form a picture of this somewhat fragile figure. While she is sensitive and intelligent, Katherine finds herself working in a role which is beneath her capabilities, a position only made worse by the small-minded bullying of her boss, the obnoxious Mr Anstey. It soon becomes clear that Katherine – a European by birth – has come to England having been displaced by the war, and as such she is permanently conscious of her status as an outsider. While Larkin never explicitly states Katherine’s nationality, there are several hints to suggest she is German, possibly a refugee of Jewish descent. From an early stage in the novel, it is also clear that she is desperately lonely. Katherine has made no friends since her arrival in England some two years earlier, preferring instead to avoid any social contact with others in favour of a solitary existence. There is a sense that she is living day by day, suppressing every reference to her former life while also disconnecting herself from any possible thoughts of what the future may bring. As Katherine’s story reveals itself, there is a strong suggestion that her family may have suffered at the hand of the Nazis. Once again this is never explicitly confirmed, only implied by the portrait Larkin creates. What we do know is that Katherine has experienced significant trauma in her life. Returning to the first section of the novel, two things happen which serve to challenge the relative stasis of Katherine’s existence. The first and most significant of these events is the re-establishment of contact between Katherine and the Fennels, an English family whom she visited for a holiday some six years earlier. When Katherine learns of an imminent visit from her former pen pal and teenage crush, Robin Fennel, she is torn between the excitement of seeing him again and the uncertainty of where such a meeting might lead. The second is precipitated by an incident at the library which culminates in Katherine being tasked with the job of escorting home a petulant young colleague (Miss Green) who is suffering from severe toothache. At first sight, this particular development may seem of little significance, but it is during this journey to her colleague’s home that Katherine comes to a realisation. All of a sudden, it dawns on her that she is responsible for Miss Green; Katherine’s emotions have been suppressed for so long that she has almost forgotten what it feels like to care for another human being. In a sudden rush of sympathy, her emotions are reawakened. In the third section of the novel, we continue to follow Katherine on this Saturday in winter to discover whether or not she finally reconnects with Robin Fennel. I don’t want to say anything else about this as it might spoil the story. Instead, I’ll consider part two of the book which goes back to the summer Katherine spent with the Fennels at their home in Oxfordshire some six years earlier, a beautifully-written section full of days spent playing tennis, taking trips to the local villages and the odd spot of punting on the river. Taken in its entirety, it helps to flesh out Katherine’s character while also casting light on her relationship with the country which is now her adopted home. Winding back to the summer in question, sixteen-year-old Katherine comes to England in two minds. On the one hand, she feels apprehensive at the thought of spending three weeks in a strange land with people she barely knows; on the other, she is somewhat intrigued by the prospect of meeting her pen pal for the first time. Once Katherine arrives at the Fennels, Robin is very attentive and polite, treating his guest like royalty, someone he is trying to impress as opposed to a friend and potential playmate. Rather frustratingly for Katherine, Robin’s older sister, Jane – a rather irritable and moody girl, at least at first – seems intent on accompanying the pair everywhere, almost as though she has been tasked with the role of chaperone for the duration of the trip. Katherine, for her part, is dying to get Robin on her own, when she hopes his real personality will finally start to emerge. During the course of this section, Larkin shows us the difficulties Katherine experiences in reading and interpreting the behaviour of others, especially given the cultural differences and language barriers at play. At various points during the holiday, Katherine is mystified as to why Robin has invited her to stay. Nevertheless, after much uncertainty, the reason for the invitation finally becomes clear. This second part of the novel ends on a note of confusion for Katherine, something that explains much of her restlessness at the prospect of seeing Robin again after so many years. I really loved A Girl in Winter. Technically speaking, it’s not perfect; the middle section is arguably too long, and there is a sense of the whole novel falling just slightly short of the sum of all the individual parts. Nevertheless, I was captivated by this nuanced portrait of Katherine, a character study that reminded me a little of Elizabeth Taylor’s A Game of Hide and Seek. As one might expect, Larkin’s prose is glorious, equally impressive in its portrayal of the nostalgic atmosphere of a bucolic English summer and its evocation of the bitterness of an unforgiving winter. Larkin is particularly strong when it comes to capturing life in an English town during wartime, an environment where people find themselves in rather diminished circumstances. In this respect, Girl calls to mind Patrick Hamilton’s The Slaves of Solitude, another 1947 novel which I absolutely adored. I’ll finish with a passage which conveys something of this atmosphere. 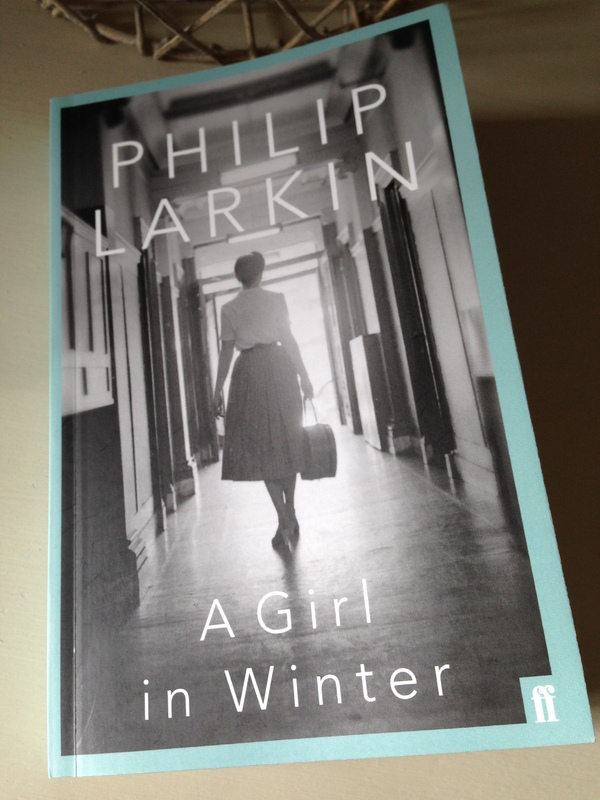 A Girl in Winter is published by Faber and Faber. This entry was posted in Book Reviews, Larkin Philip and tagged #1947Club, Book Review, Classics Club, Elizabeth Taylor, Faber and Faber, Fiction, Patrick Hamilton, Philip Larkin, UK on October 4, 2016 by JacquiWine. I seem to have developed a bit of a thing for novels featuring life in the great British boarding houses of the 1930s and ‘40s. First came Patrick Hamilton’s brilliant Slaves of Solitude, one of my favourites from last year, and now the equally marvellous Of Love and Hunger from Hamilton’s contemporary, Julian Maclaren-Ross. It will make my 2015 highlights, for sure. First published in 1947, Of Love and Hunger is narrated by Richard Fanshawe, a young man in his late twenties who finds himself in the unenviable position of trying to sell vacuum cleaners to sceptical housewives. Life as a door-to-door salesman is soemwhat miserable; the pay is lousy and with sales being so hard to come by, the prospects of commission are pretty poor. It’s all a desperate racket of course, and Fanshawe has enough nous to see through the flannel being peddled his employers. On a good day, canvassing door-to-door might yield four or five ‘dems’ (in-home demonstrations, carpets cleaned for free), and once you’re inside, there’s the question of convincing the customer to sign. Not as easy as it might appear. Here’s an excerpt from one of Fanshawe’s calls. This one was called Miss Tuke. 49, The Crescent. Small house, two storeys, villa-type; small dark drawing-room full of knick-knacks, thick old-fashioned hangings full of dust. No maid, no cleaner, woman in once a week. A cert, if I played it right. Miss Tuke didn’t seem a bad old girl either. Bit jumpy: kept looking up at the ceiling as if expecting it might fall on her at any moment. Couldn’t believe her eyes when she saw what I got out of her carpet. I won’t reveal how this one turned out, but let’s just say things don’t go quite to plan. The novel is set in a colourless seaside town near Brighton in the late 1930s, and with the country on the brink of WWII, a sense of uncertainty is simmering away in the background. Fanshawe’s current abode is a tawdry boarding house, a place where he remains under the gaze of the ever-watchful landlady, Mrs Fellows. Constantly in arrears with the rent and heavily reliant on credit, Fanshawe never seems to have enough money in his pockets. He’s living from one day to the next, but there’s always the hope that wealthy Uncle George will come through with a cheque to tide him over for a while. Meanwhile, Fanshawe’s landlady is on the lookout for any signs of money. Mrs Fellows popped out of her den next to the dining-room as I was reading the letter. All day long she sat in there by an electric fire, dressmaking. She made all her own dresses. But when I came in she always popped out, in case I got a cheque and hid it before she’d time to get her hooks in. I was six quid in arrears, and she watched my mail like a hawk. ‘Any luck, Mr Fanshawe?’ She asked, with one eye on the letters. Maclaren-Ross is excellent at portraying the dismal and somewhat futile nature of life as a door-to-door salesman. Everyone is on the fiddle: some salesmen are pulling names and addresses from the telephone directory, noting them down as ‘dems’ to meet their targets; others are hiring out cleaners instead of selling them; sales managers are flogging second-hand models to make a bit of extra cash on the sly. You name it, they’re doing it. Every now and again a sales manager swoops in for a pep talk with the troops and then disappears as quickly as possible. It’s all a load of bluster, and Maclaren-Ross captures it perfectly. You get the picture. All this might be starting to sound a little bleak, but it isn’t. The novel is shot through with dark humour, much of which stems from Maclaren-Ross’ wonderfully sharp observations on Fanshawe’s experiences as a salesman and life at the boarding house. After only a few weeks with the firm, Fanshawe gets the sack. It’s not entirely unexpected, and he ends up signing on with the one of the competitors, a bigger outfit by the name of Sucko. Cue a string of hilarious scenes as Fanshawe pitches up at the Sucko School for training, a place where he learns everything there is to know about Sucko except how to sell the bloody thing! At first, transferring to Sucko appears to be a good move. There’s talk of a team of lady-interviews to book the dems, thereby enabling the salesmen to focus on the job of selling. But support is a bit thin on the ground in Fanshawe’s area, and his Group Leader, Smiler Barnes, is a slippery character. All in all it’s the same old fiddle, just on a bigger scale. Running alongside Fanshawe’s quest to eke out a living, there is another strand in the novel. When Fanshawe’s colleague, Roper, gets the sack from the first firm, he goes away to sea for three months leaving his wife, Sukie, on her own. He asks Fanshawe to look after her, to call round or take her out every now and again. Fanshawe agrees albeit reluctantly. At first he isn’t sure about Sukie but soon warms to her as he gets to know her a little better. With her wide knowledge of books, Sukie encourages Fanshawe to put his talent for storytelling to use by writing a few stories on his time in India. (Brief flashbacks threaded through the novel reveal certain aspects of his former life as a journalist out in the East.) Of course, the inevitable happens, and Fanshawe falls in love with Sukie, a romance played out against the backdrop of prying landladies, seaside cafes and picnics in the woods. That’s about as much as I want to say about this strand – you’ll have to read the book to discover the outcome for yourself. 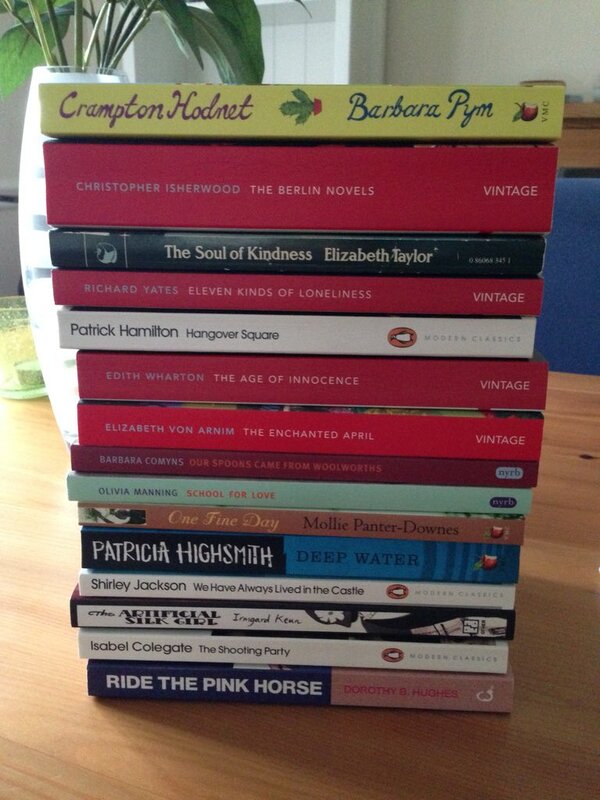 All in all, Of Love and Hunger is a wonderful novel, one of my favourite reads of the year so far. The two lead characters, Fanshawe and Sukie, are beautifully realised and more complex than appears at first sight. As the novel progresses, we see a more sensitive, vulnerable side to Fanshawe as he falls for his friend’s wife. Sukie, on the other hand, is rather fickle, her moods change like the weather. At times, she is supportive and encouraging but she can also be a bit of a tease. There are hints of a fiery temper, too. Maclaren-Ross’ clipped prose and use of slang gives the story an authentic feel. As you might expect, he captures the mood of the period perfectly. Many of the young men in the novel are scraping a living, just like Fanshawe. As the story draws to a close we are on the brink of change; war is coming, and there is a sense that many see military service as a new start in life. It saddens me to think of these men with so little ahead of them other than the prospect of war. In wrapping up, I must thank a few people for bringing this terrific novel to my attention. Firstly, Kaggsy, via her review here, and secondly, Max, who recommended it in his comments on my Hamilton piece. Guy is another fan – his review is here. 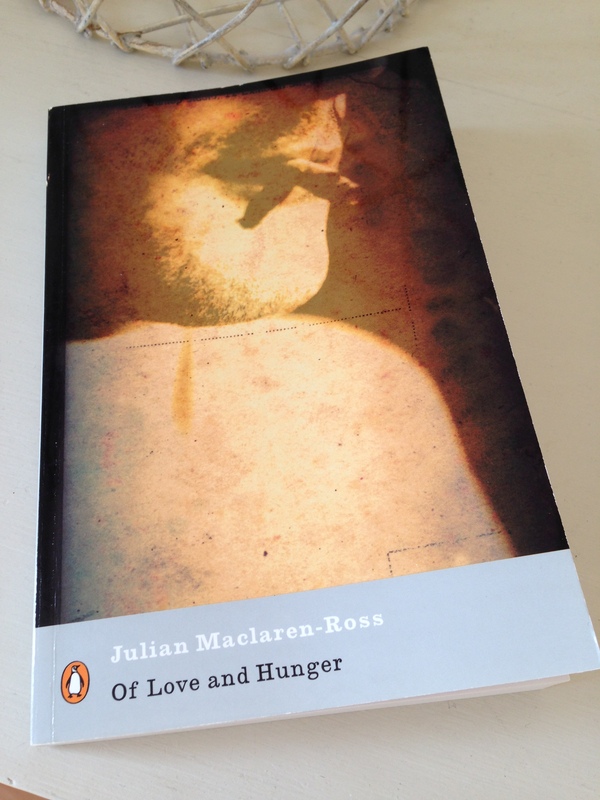 Of Love and Hunger is published in the UK by Penguin Classics. Source: personal copy. 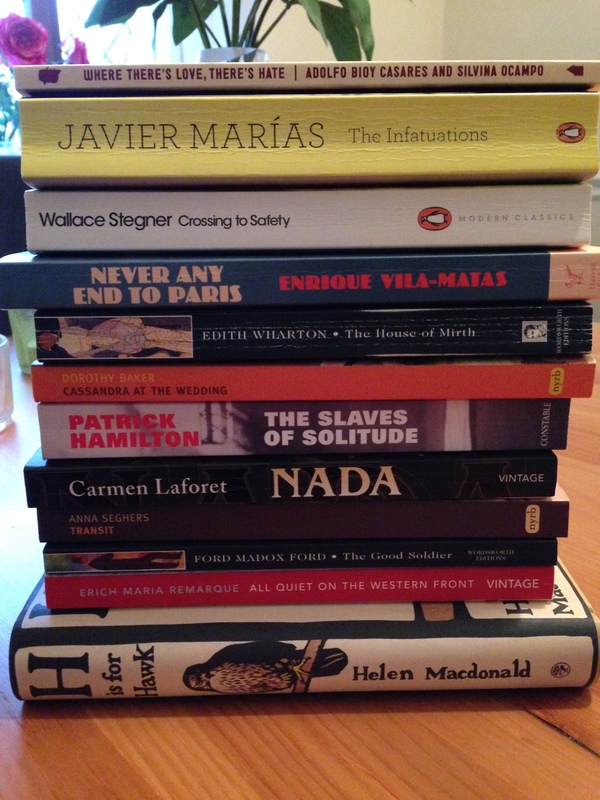 This entry was posted in Book Reviews, Maclaren-Ross Julian and tagged #1947Club, Boarding Houses, Book Review, Fiction, Julian Maclaren-Ross, Patrick Hamilton, Penguin Classics, UK on July 31, 2015 by JacquiWine. This system of separate tables, well meant as it may have been, added yet another hellish touch to the hellish melancholy prevailing. For, in the small space of the room, a word could not be uttered, a little cough could not be made, a hairpin could not be dropped at one table without being heard at all the others; and the general self-consciousness which this caused smote the room with a silence, a conversational torpor, and finally a complete apathy from which it could not stir itself. Mr Thwaites made a habit of being the first in the dining room for breakfast. No one had ever been known to beat him to it. Five, or even ten minutes before the time, he would be found sitting in his place at the table for four in the corner. It was as though he were fretful for the day to start, to be in his presidential position and to take charge of the day from the beginning. However early they appeared, those who entered after him, saying ‘Good morning, Mr. Thwaites’ and catching his eye, had a distant feeling of being on the mat for being late. Miss Roach did at any rate. This morning, the Saturday following the one on which she had had drinks with Vicki Kugelmann at the Rising Sun, Miss Roach was in the room while the gong was still being hit, and took her place at the table with Mr Thwaites. ‘Good morning,’ said Mr. Thwaites. ‘You’re very early, aren’t you?’ But this was not intended as a compliment: it still meant that she was late. It implied merely that a chronically late Miss Roach had appeared relatively early upon the scene. ‘Well,’ he said. ‘Your friends seem to be mightily distinguishing themselves as usual,’ and oh God, thought Miss Roach, not that again, not that again. Actually, the Russians were not Miss Roach’s ‘friends’. She had simply left some political publications hanging around in the Lounge, an activity that Mr. Thwaites considered ‘a diseased and obscurely Russian thing to do.’ As a consequence, Mr. Thwaites comes to associate Russia with Miss Roach and proceeds to torment her accordingly. Into Miss Roach’s miserable life comes an American officer, Lieutenant Pike, who brings a glimmer of light and spontaneity to the proceedings. He takes Miss Roach for drinks at the local pub, evening walks in the park and at one stage even appears to hint at marriage. But the spontaneous Lieutenant, who also has a fondness for rather too much whisky, often disappears for several days at a time. While Miss Roach is attracted to Pike, she’s unsure as to where she stands with him. Alongside the main narrative, Hamilton also does a terrific job in capturing the ‘endless snubbing and nagging’ nature of war and its effects on provincial towns such as Lockdon. Billboard signs lecture inhabitants at every opportunity – citizens must not waste bread, use unnecessary fuel, undertake journeys unless absolutely necessary, etc. etc. The war, which had started by making drastic demands of people, had now turned into a ‘petty pilferer’, stealthily stealing every last luxury and necessity. Even a simple sign that says ‘NO CIGARETTES. SORRY’ seems to sneer at Miss Roach with its rather sarcastic and nasty ‘sorry’. I won’t say any more about the story for fear of spoiling it, but our sympathies are with Miss Roach as we will her to escape the confines of this ‘death-in-life’ existence. Suffice it to say that The Slaves of Solitude is a downright enjoyable and satisfying novel – as devastating as it is darkly humorous, as accomplished as it is atmospheric. I can’t recommend it highly enough – one for my end-of year highlights. Max at Pechorin’s Journal has posted an excellent review of this novel. The Slaves of Solitude is published in the UK by Constable. Source: personal copy. 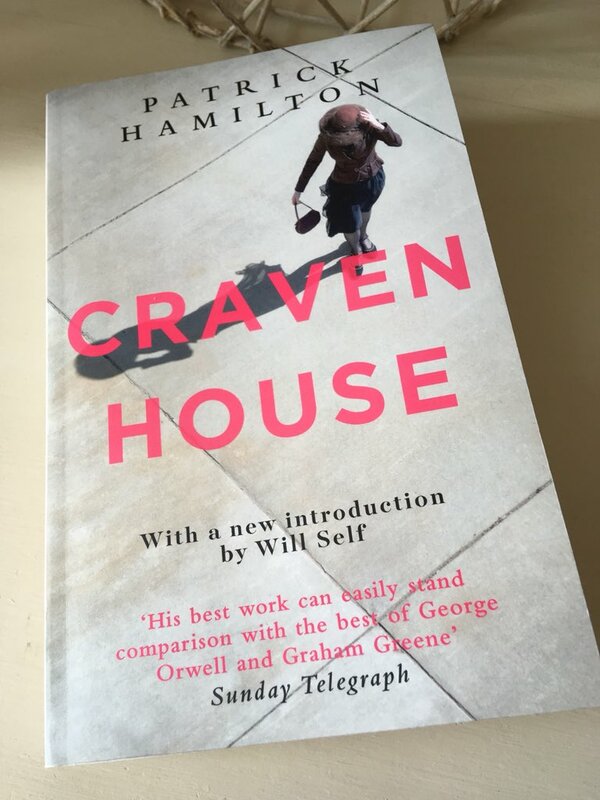 This entry was posted in Book Reviews, Hamilton Patrick and tagged #1947Club, Boarding Houses, Book Review, Constable, Fiction, Patrick Hamilton, UK on September 8, 2014 by JacquiWine.